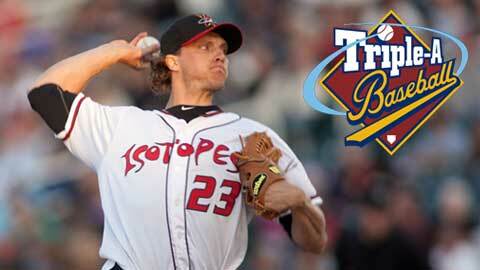 ROUND ROCK, Texas - John Ely of the Albuquerque Isotopes has been named the Pacific Coast League Pitcher of the Year, the league announced today. Mendoza, from Harvey, IL, garnered nearly three-quarters of the votes cast by the PCL field managers and representatives from the media in each city across the league. The award marks the first for an Albuquerque pitcher. The 26-year-old is currently leading the league in ERA (3.20), strikeouts (165), and wins (14) in 27 starts as he attempts to be the first pitcher to win the Pacific Coast League Triple Crown since Donne Wall of the Tucson Toros in 1995, and just the second since 1942. Opposing batters have hit just .238 while Ely is on the mound, and he has only given up 36 walks on the entire season. Ely also leads the leagues in innings-pitched (168.2) and WHIP (1.10). Ely is unbeaten in his last eight starts, which included a six-game winning streak. Perhaps most impressive is the right-hander pitches in hitter-friendly Albuquerque, where he has led the Isotopes to first place in the American Southern division as they seek an opportunity to play in the postseason. Ely was selected to the Pacific Coast League All-Star team in July, pitching a scoreless inning in the PCL's 3-0 win over the International League in the Triple-A All-Star Game in Buffalo. On Monday, he was also named as the right-handed pitcher for the league's Post-Season All-Star team. Ely was a third-round draft pick by the Chicago White Sox in 2007 out of Miami University in Ohio. He was traded to the Los Angeles Dodgers before the 2010 season in a deal for Juan Pierre, and made his Major League debut on April 28th against the New York Mets, going six innings and striking out four. Others to receive votes for the Pitcher of the Year award include Graham Godfrey (Sacramento), Ryan Verdugo (Omaha), and Sean O'Sullivan (Las Vegas). All statistics used are through Tuesday, August 28th.